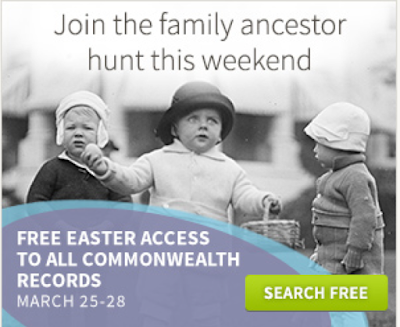 This weekend (March 25-28) Ancestry.ca is offering free access to their Commonwealth records. Many genealogists do not realize that Ancestry offers two different freebies. One is FREE ACCESS (which this is) and NO credit card is required. You have to sign up with your email address and name to view the records, but NO CREDIT CARD is needed. The second is FREE TRIAL where a credit card IS required. At the end of the Free Trial period you cancel, and your card is not charged.